Uncle Jimmy visited on Boxing Day, and remarked on how old the bathroom floor was looking. "Jim'll Fix It" is a phrase we used to use before it became a bad phrase to use. So, Jimmy arrived this morning, with new laminate floorboards, and got to work. .. because he's Uncle Jimmy, and that's what he does. 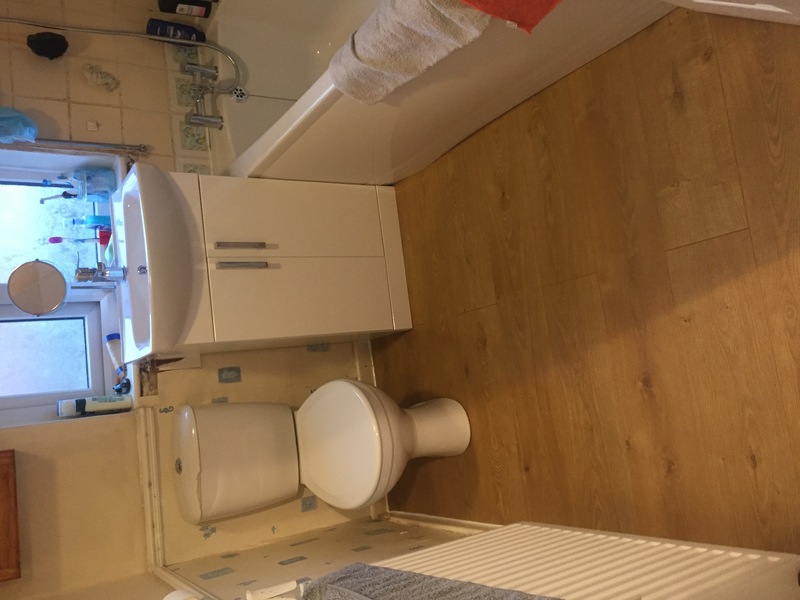 "I'll need to lift the toilet and sink to get them fitted properly." "Look at the state of these pipes.."
"I'm just off to the shop.."
"What time does that shop shut?" ..it's 6pm. He started at 10.. poor Uncle Jimmy.. There's never an easy job in this house. .. there is now swearing. FWIW > Uncle Jimmy works for Costains, and is 100% qualified to do pretty much anything. ... except in this house!!! My brother visited my mom and me at her place. My mother had an extra room filled with closets and she no longer needed them(my mom and dad never used them actually) I spend time getting the room empty before my brother arived and when he was there we started to take them apart. We went to eat at my brothers and half of the car was filled with planks when we went there. When we got back at my moms place we disassambled the last and he took them with them. A car full. 5 closets in total. There is now a completely empty bedroom ready to be used. I started looking at the music shop website for a korg Kronos or Yamaha Montage to place there. Those things are about 3000 euro's for the smallest versions! But I feel tempted at 'getting back' into more serious music production. WIth my father dying so fast I feel that I just could buy one and have fun with it now that everything is good instead of having so much money in the bank. A car is really out of the question since I found out insurance for starters alone costs half of what I have left over every month. I might have a serious music workstation on monday! Uncle Jimmy's now happy that the toilet at least works, even if the rest of the bathroom's still in a right state, and will be back tomorrow for episode two. 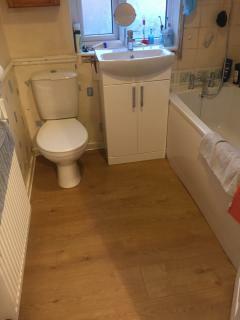 After a day and a half of swearing and lots of sawing, the bathroom's finally done. He's fitted a new sink, and had to replace the toilet cistern, but has kept the cistern lid for ... that little crack in the corner of the lid of the cistern is when I fell, after having my first set of brain surgery.. ..
New taps all round, and a lovely new floor. My brother moved into his new house last week. It looks pretty new there. There is water in the front and scotisch highlanders(cows or bulls?) walk there. Guarded by a electric fence though. And I just went ahead and ordered the Korg Kronos. The 73 key version. I ordered a stand and bench and 50 watt monitor speakers and a pedal with it. It should be here on wednesday. Most expensive thing I ever ordered! But when I was young and poor I dreamed of owning a pro keyboard/synth after reading those demosceners scrolltext about their gear. Uncle Jimmy, the miracle worker, is now attempting to fix my sister's iPhone.. It's great to have an Uncle Jimmy, but he's incredibly popular, so it's rare to get a chance to make any use of his amazing talents. We very rarely get to see him. He works all across the country, leaping from job to job, striving to put right what once went wrong. For a long time, his job at Costains was to do post-job-maintenance, but he kept going above and beyond, to the point where customers would directly request his help. Get him in to fix a customer's leak, and he'll do the whole bathroom, that kind of thing. Nowadays (last he talked of it) he heads up an entire taskforce of "Uncle Jimmy's", handpicked jobbies who try to get things done. .. Yeah, we could all do with an Uncle Jimmy, and we're glad we occasionally get to see him over Xmas.